Brain Awareness Week, a global campaign to raise public awareness about the progress and benefits of brain research, including research into the causes of Parkinson’s disease and other problems of the brain and nervous system and how to treat them, will take place March 12 to 18. “BAW focuses international attention on the field of neuroscience and offers opportunities for teachers and students to engage in fun educational activities. From dynamic classroom presentations and laboratory tours to enlightening museum exhibits and public lectures,” says the Society for Neuroscience. The Society for Neuroscience is a nonprofit organization of 40,000 scientists and physicians who study the brain and nervous system. It has the stated mission of advancing the understanding of the brain and nervous system. 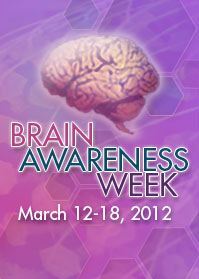 For more information on Brain Awareness Week, see the website of the Society for Neuroscience. See also the website of the National Parkinson Foundation.